Emmett H. Buell, Jr. and Lee Sigelman. Second Edition, revised and updated. Lawrence: University Press of Kansas, September 2009. Cloth: ISBN 978-0700616794, $39.95; paper: ISBN 978-0-7006-1680-0, $19.95. 392 pages. Elections continue to get nastier and nastier even as the campaign seasons grow longer and longer. The next Presidential election will be more negative than the last, which was more negative than the one that preceded it. Millions of Americans would likely embrace these seeming truisms. Yet is it the case that presidential elections get more negative with each passing quadrennial? This is the fundamental question at the heart of Attack Politics. Buell and Sigelman actually pursue two goals in Attack Politics. One is to provide something of a synthetic overview of American presidential elections since 1960, albeit not ordered chronologically and without ever really explaining why they choose 1960 as their earliest election. The second of their aims is the titular goal of the book—to discern the nature of negative campaigns since Kennedy and Nixon faced off in their down-to-the-wire 1960 race. Arguably they accomplish the first goal better than the second despite their putative purpose. After a general introductory chapter on “Negativity and Presidential Campaigns,” rather than follow a chronological path, Buell and Sigelman organize their chapters based on how closely contested particular elections were. They thus group the elections of 1964, 1972, and 1984 together as “Runaway races.” 1988, 1992, and 1996 fall under “Somewhat Competitive.” 1968 and 1976 were “Comeback Races.” 1960 and 1980 each warrant their own chapter as “Dead Heat” races while the authors bundle 2000 and 2004 into another “dead heat” chapter. 2008’s “Dead Heat and Somewhat Competitive” race occupies the last election-focused chapter, making this an especially timely book. They close with a chapter of summary and synthesis, though they also include a somewhat inexplicable appendix on the “Cold War Background to 1960 Presidential Context,” as if the 1960 campaign was the only one that fell against a backdrop in which the Cold War or other major events played a significant role. The overviews of each election are fantastic. Clear and concise, balancing analysis and description, the summaries are the strongest element of the book and will be especially welcome in classes. Buell and Sigelman include fine assessments of the major players, prevailing issues, the dynamics, and the trends in each campaign while providing sound historical context. They make the elections come alive and provide a useful reference and overview even for specialists. 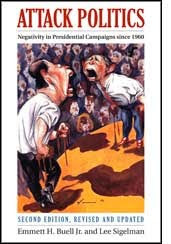 But the book’s raison d’etre is its investigation of negative campaigning, and on this issue the results are mixed. Part of the problem is inherent to the effort. Political scientists seem to believe that all things can be quantified and that quantitative analysis is better than its qualitative equivalent (even though the best parts of this book, by far, are the qualitative sections). They also tend to place tremendous faith in models. But human activity is not a math problem, the world does not adhere to models, and models rarely explain the world as it is lived. The problem of quantification in this case is not one of high-level mathematics, to be sure. But there is something perplexing about Buell’s and Sigelman’s decision simply to add up all moments of negative campaigning in ads and speeches and to have them all count equally. I would imagine that the number of negative campaign moments tells us something, but it is far from certain that those numbers tells us all that much about tone and intensity, about which negative ads or sound bytes stick and which do not, and perhaps most significantly, which qualify as being dirtier than the others, and thus more poisonous. For when most people think about negative campaigning, they are not simply referring to candidates’ criticisms of one another. They are also referring to a noxious air of personal attacks and misrepresentations. There is a difference between saying that Barack Obama “pals around with terrorists” and saying that he is too inexperienced for office. Buell and Sigelman do not make that differentiation, to the detriment of their analysis. The problem with modeling in the book is slightly different. The authors do not freight their argument with their own model. Instead they rely on someone else’s model and test to see if it applies in presidential campaigns since 1960. This reactive methodology may well be of some use to other political scientists, and that could prove important in pushing the scholarship forward, but given the accessibility of the election summaries, this book ends up being a peculiar hybrid of specialist scholarship and generalist accessibility. Buell and Sigelman want to test one of the prevailing theories, the “Skaperdas-Grofman Model,” which asserts that candidates choose to go negative when the benefits outweigh the potential drawbacks. This seemingly obvious conclusion provides a series of circumstances as to when a candidate is likely to go negative, with the most prevalent being that a candidate is most likely to engage in negative campaigning if they are behind in the polls. Using Skaperdas-Grofman as their springboard, Buell and Sigelman assess the presidential elections since 1960 in their various configurations of closeness. And their conclusion is: Skaperdas-Grofman is sometimes accurate. Except when it is not. This seems like a pretty apt, if unintended, summation of predictive models as a whole: They work except for when they do not. This seems an argument for steering clear of models and for trusting more subjective but also more humble analytical approaches. Buell and Sigelman are at their strongest when they steer clear of models and when they simply describe and analyze the presidential campaigns themselves. Their book is weakest where the interpretive framework is seemingly more rigorous. Nonetheless, despite its shortcomings Attack Politics represents an important contribution to our understanding of negative campaigning in American presidential elections in the last half century. Students will welcome the treatment of the individual elections and practitioners will appreciate another contribution to our understanding of modern electoral politics. Perhaps future scholars will draw from Buell and Sigelman but will learn to trust their own interpretations, shorn of the artifice of creating models that can only statically (and thus falsely) capture the dynamic and theory-defying world of politics.